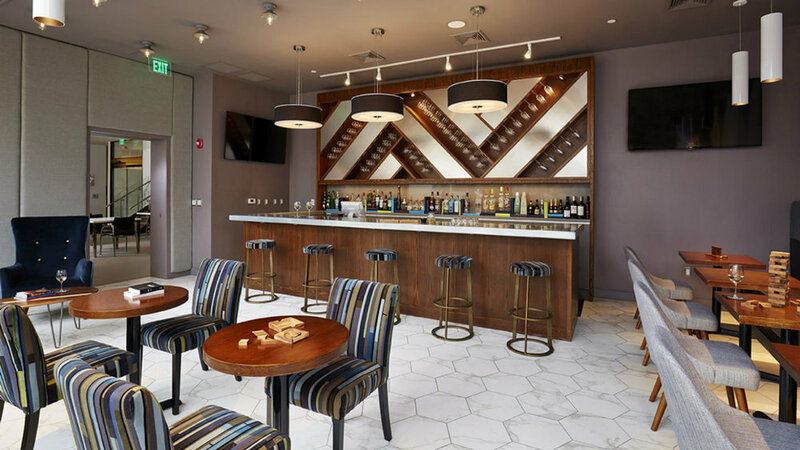 Located within the Element Hotel in Harrison, New Jersey, The Station serves as more than an on-site dining experience. Its prime location just steps from the PATH make this restaurant, café, and bar a destination for morning commuters into Manhattan, as well as a nighttime reprieve after a long days work (or play!). Locals and guests alike can also enjoy the space during the day as the sun-lit atmosphere provides the perfect location for a mid-day meeting, or a quiet place to relax. The bold color palette applied to the materials plays off from the sophisticated interiors, while the sharp angle of the logo and dynamic color blocking imply movement, and a subtle playfulness, alluding to the nearby bustling train station.